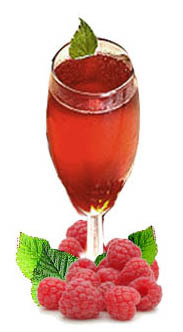 A raspberry-based Christmas punch seems fitting for this particular part of Washington state, considering that Whatcom County - the county in which I live - boasts the largest annual raspberry harvest in the United States. In case you're wondering about the term "shrub," the name of this and other drinks in the "shrub" category come from the Arabic word sharab which means, literally, "to drink." Shrubs are an old time beverage, the word "shrub" (as descriptive of a drink) going back to at least 1747 where the Oxford Dictionary defined it as, "..."any of various acidulated beverages made from the juice of fruit, sugar, and other ingredients..."
Classic shrub recipes often call for the addition of vinegar or brandy to give it zing, but the following recipe relies on a can of lemonade concentrate and ginger ale for that. Thaw raspberries, then cook all four packages in a saucepan for ten minutes. Makes 24 servings of about 1/2 cup each.